A hand-painted silk scroll created in memory of Hawaii's Queen Liliuokalani, who was also a wonderful poet and songwriter. This is the title of one of her compositions, which so aptly defines the semi-temperate rain forest I live in. 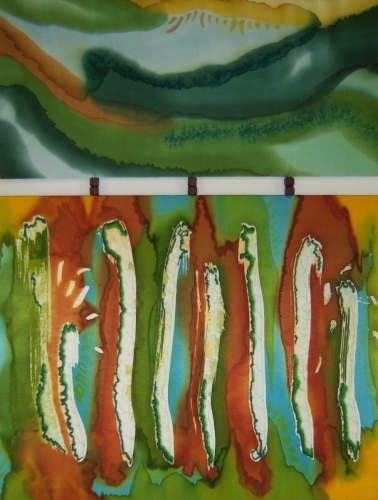 Hanging scroll of dye on charmeuse silk with wax resist, 11” x 29”. In the Asian tradition, these light, vertical, original paintings are great for many locations on home or office walls and are easily rolled for shipping. Both ends enclose wooden dowels. 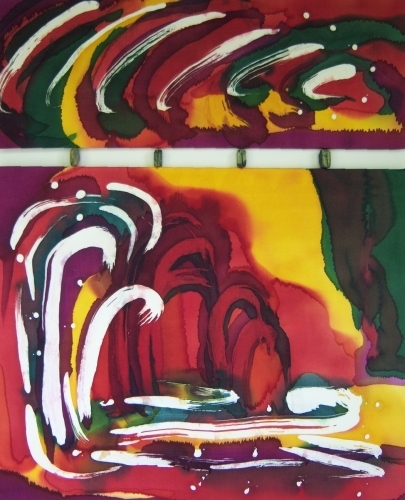 Hanging scroll of dye on charmeuse silk with wax resist. 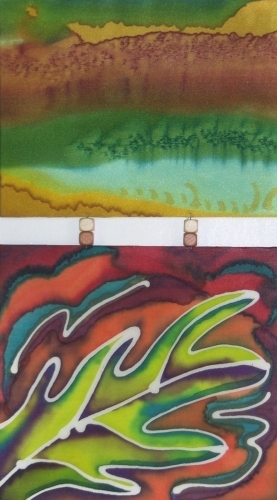 In the Asian tradition, these light, vertical, original paintings are great for many locations on home or office walls and are easily rolled for shipping. Ends are finished nicely with stained & varnished wood, felt-like backing fabric and sawtooth hangar. Dye on silk with wax resist. Created to make fine art silk originals accessible to more people (no matt, frame, glazing required). Lightweight, colorful additions to many wall spaces. Silk is mounted on acid free foam core, adding matt board to the back to finish the piece nicely, then combining the two pieces with beads using strong thread. Finished off with a glued in sawtooth hangar. Photo has off-white wall showing between the two pieces. Dye on silk with wax resist. Created to make fine art silk originals accessible to more people (no matt, frame, glazing required). Lightweight, colorful additions to many wall spaces. Silk is mounted on acid free foam core, adding matt board to the back to finish the piece nicely, then combining the two pieces with beads using strong thread. Finished off with a glued in sawtooth hangar. Photo has white wall showing between the two pieces. The Hala tree grows in abundance around the coastal areas here. Hawaiians of old used the plant for so many purposes. 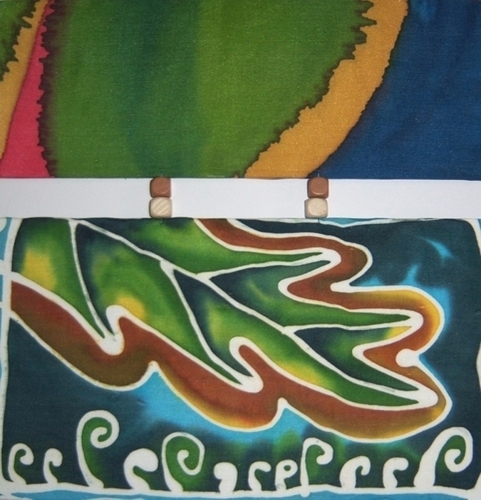 I've used the dried fruit sections as paint brushes, and made bracelets from the dried leaves, called lauhala weaving. 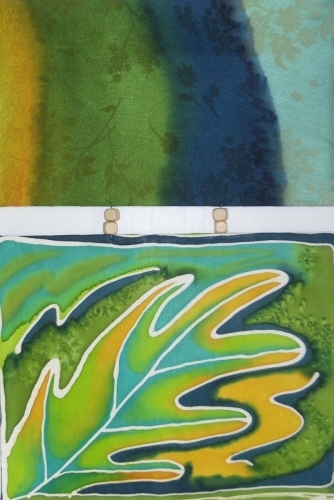 Hanging scroll of dye on charmeuse silk with wax resist with wooden dowels in sewn sleeve top and bottom. In the Asian tradition, these light, vertical, original paintings are great for many locations on home or office walls and are easily rolled for shipping. 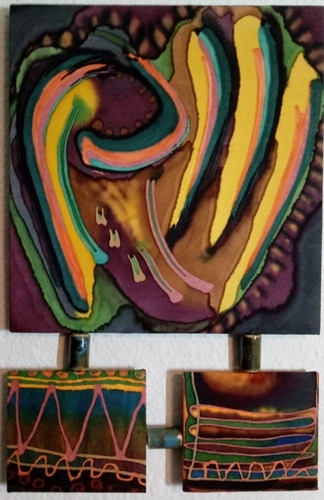 Dye on silk with wax resist. Created to make fine art silk originals accessible to more people (no matt, frame, glazing required). Lightweight, colorful addition for many wall spaces. Silk is mounted on acid free foam core, adding matt board to the back to finish the piece nicely, then combining the two pieces with beads using strong thread. Finished off with a glued in sawtooth hangar. Photo has white wall showing between the two pieces. Action and mood are set by the colors. 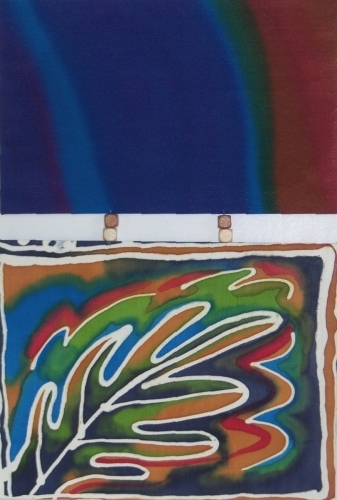 Hanging scroll of dye on charmeuse silk with wax resist. In the Asian tradition, these light, vertical, original paintings are great for many locations on home or office walls and are easily rolled for shipping. Both ends enclose wooden dowels. 20.5" x 5"28.75" x 7"35" x 8.5"
Orchids abound here in Hawaii. Just pop one on a tree, and they grow! The lady Slipper is also the state flower of Minnesota, where I was born and grew up loving being plopped in a tree! Dye on silk with wax resist. Created to make fine art silk originals accessible to more people (no matt, frame, glazing required). Lightweight, colorful addition for many wall spaces. 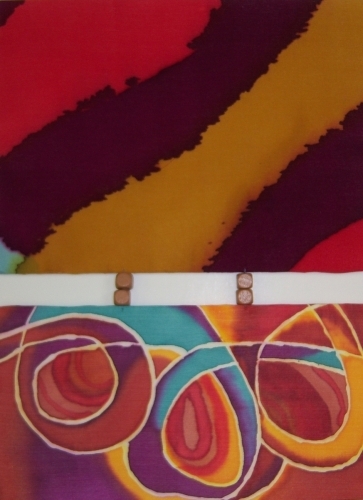 Silk is mounted on acid free foam core, adding matt board to the back to finish the piece nicely, then combining the two pieces with beads using strong thread. Finished off with a glued in sawtooth hangar. Photo has white wall showing between the three pieces.